Ready-made riddle cards to put into kids' lunches! Ready-made riddle cards kids love to find in their lunch! Includes 45 riddle cards and stickers for any occasion. Each card has space to write a short note to brighten their day! The Second-Annual National Riddle Day was a success! More than 100 participated with us in Madeira at the National Riddle Day Fun Hunt, a scavenger-hunt style event across downtown Madeira at 11 different merchants. 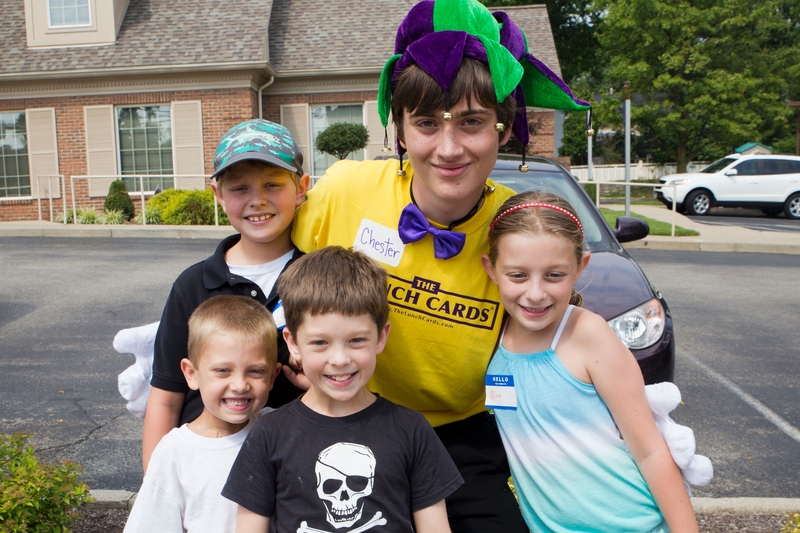 See photos from the Riddle Day Fun Hunt here. Thanks again to our co-sponsor, US Bank Madeira! Thanks also to participating merchants: Absolutely Needlepoint, A Tavola, Creativities, the Bookshelf, Freida's Desserts, Adrien Pharmacy, Cheers to Art, Coffee Please, Depot Barbecue, PNC Bank, Rory Maxwell, CherryBlossom Design Photography, Domino's, Gigi's Cupakes and Madeira Kroger! 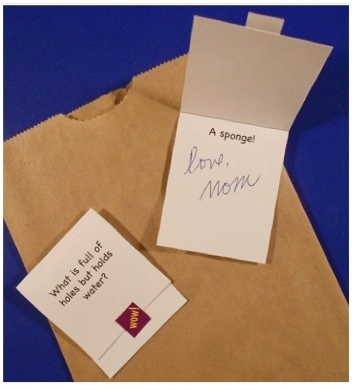 Ready-made riddle cards kids love to find in their lunches! Give a little T.L.C everyday by placing a card in a lunch or anywhere! For ages 6 and up. From our ads in The Living Magazines! What is a shark's favorite game? Swallow the leader! What makes the letter "G" scary? It turns your host into a ghost! What key won't open a door? A tur-key! Why is a cat on the beach like Christmas? It has sandy claws! What kind of cup doesn't hold water? A cup-cake! What did the cat give to his valentine? Purrr-fume! When do dragons stop eating? Mid-knight! What kind of bunny can't hop? A chocolate bunny! What day of school is the children's favorite? The last day! Why are cats good at video games? They have 9 lives! Copyright © 2013-2019 The Lunch Cards. All rights reserved.